recognize that in the wealthiest country in the world, we are going to protect vulnerable people, including senior citizens and people with disabilities." To see if your Representative is a member of the “Expand” caucus, click here. 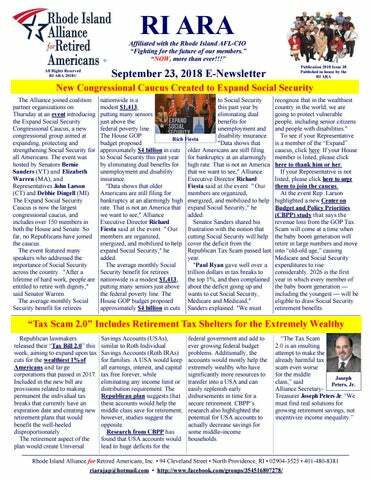 If your House member is listed, please click here to thank him or her. If your Representative is not listed, please click here to urge them to join the caucus. At the event Rep. Larson highlighted a new Center on Budget and Policy Priorities (CBPP) study that says the revenue loss from the GOP Tax Scam will come at a time when the baby boom generation will retire in large numbers and move into “old-old age,” causing Medicare and Social Security expenditures to rise considerably. 2026 is the first year in which every member of the baby boom generation — including the youngest — will be eligible to draw Social Security retirement benefits. federal government and add to ever growing federal budget problems. Additionally, the accounts would mostly help the extremely wealthy who have significantly more resources to transfer into a USA and can easily replenish early disbursements in time for a secure retirement. CBPP’s research also highlighted the potential for USA accounts to actually decrease savings for some middle-income households. can better access needed care. Medicare Rights knows that prescription drug affordability is an ongoing challenge. Every day on our National Consumer Helpline, we hear from older adults and people with disabilities who are struggling to cover the costs of their medications. Tell Congress to stand up for people with Medicare and preserve these beneficial Part D changes. Last week, a coalition of advocates, including Medicare Rights, AARP, Center for Medicare Advocacy, Justice in Aging, Alliance for Retired Americans, and Patients for Affordable Drugs Now, asked Congress to maintain the Medicare Part D donut hole reforms that were included in the BBA. We made it clear that these changes will provide tangible relief to millions of Americans. Join us by amplifying our message and weighing in with your lawmakers today! Medicare Rights Comments on Proposed Changes to Medicare’s DME Program .This week, the Medicare Rights Center submitted comments in response to a proposal from the Centers for Medicare & Medicaid Services (CMS) that would, in part, make major changes to the Durable Medical Equipment, Prosthetics, Orthotics, and Supplies (DMEPOS) Competitive Bidding Program. Through the DMEPOS bidding program, medical equipment suppliers compete for Medicare’s business based on quality and price, by submitting bids to serve beneficiaries in a specified geographical region. In the proposed rule, CMS is seeking to effectively suspend this program when current contracts expire at the end of 2018. The program would be suspended until new contracts are awarded under the outlined new payment methodology, however, CMS does not provide a time frame for when new contracts would begin. considerable benefits. Accordingly, we urge CMS to revisit its approach and immediately open bidding for service provision under the current program for the 2019 plan year. If CMS wishes to establish a new methodology for later plan years, we ask that it do so in a way that preserves beneficiary protections and the status quo, and allows time for a smooth transition. Medicare Rights continues to strongly support the DMEPOS Competitive Bidding Program, and its role in advancing how Medicare pays for medical equipment and services. We look forward to working with stakeholders and policymakers to ensure the program remains well-positioned to best meet the needs of people with Medicare and their families. Read our comments on the DMEPOS Competitive Bidding Program. Read our National Helpline Trends report. has strongly argued against keeping protections contained in the Affordable Care Act for people with pre-existing health conditions,” President Roach told listeners. “This is particularly important to older Americans, since we know 84% of people 55 - 64 have at least one pre-existing health condition.” Sen. Brown shared a personal story about how pre-existing conditions have affected his family and explained why confirming Judge Kavanaugh would be harmful for seniors, discussing Kavanaugh’s rulings favoring wealthy corporate interests over working Americans. Kavanaugh’s confirmation hearings last week. “We must stop the confirmation of Robert Brett Kavanaugh to Roach, Jr become the next justice on the United States Supreme Court, and we need your help to do it before the Senate votes on September 20,” said President Roach. 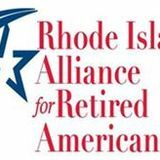 The Alliance is urging you to call your Senators and explain why Judge Kavanaugh is dangerous for retirees. Call (855) 712-8430 to be patched through to your Senator’s office. reason for the wider budget deficits, not the Republican-led tax cuts activated this year. Kudlow did not specify where future cuts would be made. "We're going to run deficits of about 4 to 5 percent of GDP for the next year or two, OK. I'd rather they were lower but it's not a catastrophe," Kudlow said. "Going down the road, of course we'd like to slim that down as much as possible and we'll work at it." elections. "I don't think it will get through the whole Congress" before the election, he said, but added that making the personal tax cuts permanent "is a good message" and disagreed with forecasts that they would further increase budget deficits. It was the TAX SCAM not SS!! Get ready for a wild ride. Keep voting for these people that want to cut, cut, cut your EARNED BENEFITS to give more tax breaks to the wealthy and big corporate executives. When older people use drugs like Valium or Xanax to calm anxiety or help them sleep, they run a high risk of becoming drug -dependent, new research suggests. In the study of almost 600 adults averaging 78 years of age, about one in four who were prescribed these types of benzodiazepine sedatives ended up using them for at least a year. That's despite warnings against long-term use of the drugs, especially among older people. Benzodiazepines -- a class that also includes Ativan, Halcion, and Klonopin -- can raise the risk of car crashes, falls, broken hips and other harmful side effects, experts warn. So the new study "shows that we need to help providers start with the end in mind when prescribing a benzodiazepine, by beginning with a short-duration prescription and engage patients in discussions of when to reevaluate their symptoms and begin tapering the patient off," said lead author Dr. Lauren Gerlach. She's a geriatric psychiatrist at the University of Michigan in Ann Arbor. "We also need to educate providers about effective nonpharmaceutical treatment alternatives, such as cognitive behavioral therapy, for these patients," Gerlach said in a university news release. more impressively, another team of researchers managed to rejuvenate aging human cells. Now, a new study adds to the evidence that aging can indeed be reversed. Scientists led by Dr. Ming-Hui Zou — the director of the Center for Molecular and Translational Medicine at Georgia State University in Atlanta — showed that fasting, or restricting calorie intake, can produce a molecule that delays vascular aging. with public health insurance and rural residents. They also found the rates of both types of pain were lower among adults with at least a bachelor's degree. Pain can be debilitating and also challenging to treat, especially as opioids have come under scrutiny for their role in fueling a nationwide epidemic. It can also be costly, with chronic pain costing an estimated $560 billion annually between direct medical costs, lost productivity and disability, according to a 2011 report from the Institute of Medicine of the National Academies. Eating fiber can delay brain aging Fiber is a key element of a healthful diet. New research breaks down the mechanism by which it can delay age-related brain inflammation. If all the studies that urge people to consume a diet rich in fruits, vegetables, and whole grains for a healthy life haven't convinced you yet to add more broccoli to your plate, perhaps this latest research will. Eating fiber-rich foods — such as broccoli, nuts, oats, beans, and whole-grain bread — might help delay brain aging by triggering the production of a short-chain fatty acid that has anti-inflammatory properties.